Saracens appear to be a team with a point to prove in Europe this season. Having lost their Champions Cup crown to Leinster last season, the English side are smoking all comers in this season's competition. They qualified as top seeds for the knock-out stages and beat Glasgow Warriors 56-27 in the last eight. Sarries had to negotiate the Glasgow threat, for all it was worth, without star out-half Owen Farrell. The England and Lions star was expecting his first child, with wife Georgie. On Saturday night, Georgie Farrell went into labour. Farrell kept his club in the loop, in the early stages of his wife's labour. Sarries director of rugby Mark McCall said there was a 'rough cut-off point' when they would go with Alex Goode over Farrell in the quarter final clash. "I don't actually know if he's had the baby yet." "We had a rough cut-off point," McCall continued. "His wife went into labour last night. At 8.30am he was pretty confident it would all happen, but it didn't. "But the important thing was that he was where he should have been - with his wife." One hopes all went well and that Farrell is being the attendant husband and father on this special day. 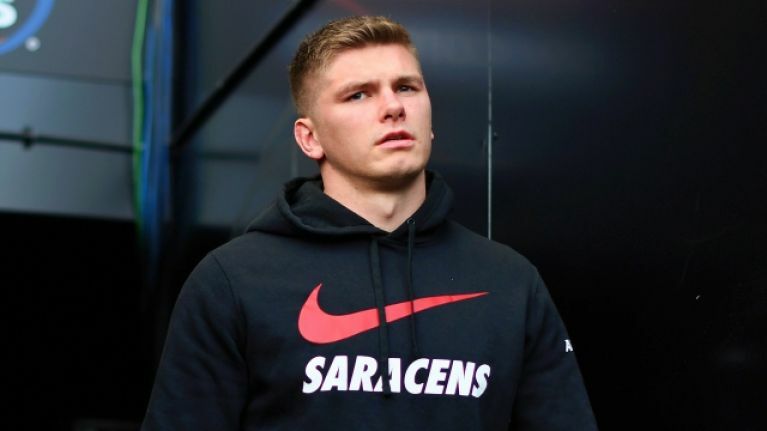 Rugby games will come and go, but Owen Farrell should take at least a few days off to be with his ever-growing family.